I'm a Cover Model--This Month! As many of you know, my cat Samhain has been battling chronic renal failure for over 6 years. She was diagnosed young--at about 5 or 6 (she was a stray I got from the shelter, so they didn't know for sure), two years after I adopted her. At the time she was diagnosed, she'd gone from a tiny 7.5 lbs to an alarming 5.5 lbs. At the time, my vet (who I adore) said she probably would have 3 years. But she underestimated the stubborn nature of my little fighter. A couple of weeks ago, we did another set of blood tests and the results weren't good. Samhain was back down to 5.9 lbs and had become a little anemic, and developed a heart murmur. Dr. Baker said that we might have 2-3 months, February or March...maybe April, if we were lucky. We started her on a few new meds for nausea and such and she seemed to be doing better, and I bought her a heated cat bed which she loved, since she was always cold. I canceled my trip to Pantheacon in February, and prepared to fight the good fight as long as I could. But in this as in all things, Samhain apparently had her own ideas. She had a good day today, seemed just as always, and ate just fine. I fed her upstairs at 4 and went down to take a nap. When I went back up at 5, she was curled up in her heated bed...but she was gone. I think her heart just gave out. Mine is threatening to do much the same right now. All cats are special, but Samhain was one of the REALLY special ones. She was loving and sweet, never holding a grudge even when I insisted on sticking her with a giant needle. She would sit on my lap or my legs when I wrote. I'm really going to miss her. But despite all the struggles, it was worth every moment. Every day with her was a gift. Goodbye, Samhain. I love you. Thanks for coming to stay with me for a time. See you on the other side. Heya! I hope you all had a wonderful holiday (whichever one you celebrate). Beka Yancy walked through the rows of artists and craftspeople at the local street fair and tried not to panic. It wasn’t that there weren’t plenty of beautiful things to choose from; it was more that the two people she needed gifts for were simply impossible to buy for. Beka sighed. It had taken a lot more than a hand gesture to stop that eruption, but she’d learned from long experience that there was no point in arguing with Chewie, her Chudo-Yudo. Not only was he a dragon, albeit one currently disguised as a gigantic black Newfoundland dog, but he was also as stubborn as he was magical. Luckily, he was also pretty laid back. Which was good, since they were in Santa Carmelita, home of the Seriously Laid Back. Normally, Beka fit in with her California coast brethren just fine. To all appearances, she was just a typical pretty blonde surfer girl with slight hippy-freak tendencies. There was no way to tell by looking at her that she was also a Baba Yaga, one of a small number of powerful witches who were responsible for watching over the doorways between our world and the Otherworld, keeping the balance of nature, and occasionally (if it couldn’t be avoided), helping out a worthy seeker. In fact, most days Chewie would still be back at their travelling home, once a hut on chicken legs but now a marginally less conspicuous converted school bus, standing guard over the Water of Life and Death that helped to keep a Baba Yaga magically strong and healthy. But today was different, since they had guests who could be relied upon to keep the Water (and everything else) safe. The very guests, in fact, that Beka was futilely attempting to find Winter Solstice gifts for, before she had to head back to the bus with the ingredients for a Yuletide feast and celebration. And it would be a celebration, there was no mistaking that. It was a rare occasion when Beka and her two Baba Yaga sisters, who between them watched over the territory in the United States, managed to get together. Usually they were all too busy putting out fires, both magical and literal (or in Bella’s case, occasionally starting them). So this was going to be a joyous holiday celebration, shared between the closest of friends. If only she could find the perfect gifts. But what on earth did you get for two powerful witches, one of whom had been around for eighty years (even if she only looked thirty) and tended to be, it could be said, a tad bit cranky, and the other of whom lived in the middle of the woods most of the time and had an unfortunate tendency to burst into flame when she was upset? Chewie gave the coughing growl that was his version of a laugh, and a mother moved her child two aisles over. It was silly, she knew, to want so much for the holiday to be perfect, but they had all been raised by the Baba Yagas who had found them as children and realized that their magical potential would make them suitable as replacements. They were the closest thing to family any of them had, and it was a rare Yule when they could all be together. The solstice was a magical time, even in a part of the country that had glistening beach sand instead of snow. Beka was determined to make it a celebration to remember. She’d already picked up all the fixings for a fabulous dinner, and as usual, Barbara had brought along some amazing wine and Bella had baked a pie. All she needed was to find two perfect gifts. “What about those nice woven straw hats?” the dragon-dog asked. He was chewing on a large hotdog. Beka decided it would be better not to ask him where he’d gotten it. “You’re always hungry,” Beka said, admiring more than complaining. “I’m very large,” he said. “Yes, yes you are,” she agreed, patting him affectionately on his massive head. Then she saw something that made her stop in her tracks, causing Chewie to almost knock her over as he bumped into the back of her legs. She walked slowly over to a small, slightly ragged booth on the outskirts of the gathering. The tent had seen better days; its canopy listed decidedly to the right, and there were places where it had clearly been mended more than once. It was more beige than white, and its metal poles were bent and crooked, much like the old woman who sat at the table inside, a shawl wrapped around her shoulders even though the day was reasonably warm. Her wares were set out on a faded flower-embroidered cloth, instead of a fancy display, but neither the surroundings nor the lack of embellishment could take away from the simple beauty of the objects on the table. “Are those matryoskas?” Beka asked, gazing at the hand-painted face on a wooden doll. The details of the simple cylindrical figure was elaborately drawn and stunningly detailed, from the gleaming amber eyes to the ebony tresses and the lacy black dress that adorned the figure. The one Beka reached for was painted in darker colors, but there was one sitting next to it which bore the image of a red-haired woman wearing a gown of vibrant green. They were elegant and old-fashioned and a little mysterious. In short, they were perfect. “They are,” the woman said, showing worn teeth in a pleased smile. “You know of Russian nesting dolls?” She had a trace of an accent, musical and exotic despite her drab surroundings. She lifted the top doll to show the smaller ones underneath, each slightly different but still meticulously painted. The old woman’s eyes widened beneath slightly bushy gray brows. “Both?” she said. “They are a little dear, I’m afraid. Perhaps more than you wish to spend.” She sounded resigned, as though she’d spent a long day telling people the price of her beautiful dolls, only to have them turn and walk away. Chewie woofed in agreement, making the woman’s eyes widen even further. The woman opened the pouch and peered inside, then gazed up at Beka in amazement. Apparently no one had ever given her a bag full of ancient gold coins before. “Are they real?” she asked, one gnarled finger reaching inside to touch them. “As real as your talent,” Beka said quite firmly. If there was one thing a Baba Yaga knew, it was the importance of giving a fair trade. All the fairy tales said so. “If you could see the look on my friends’ faces when I give them these, you would know that I have gotten the better part of the deal,” Beka said, her heart filled with joy as the woman wrapped her perfect gifts in crinkling gold tissue paper. Beka nodded, the bargain accepted. “A blessed solstice to you,” she said. One of the problems with the holidays is that the actual events rarely live up to the anticipation. This year was totally an exception to the rule. Blue Moon Circle, our families, and friends (included my visiting step-daughter Jennifer, who was a BMC member before she moved to CA years ago) had a glorious Yule dinner party last Saturday night. The house was filled with light, joy, and laughter as we came together to feast and play our traditional silly gift exchange game. If that wasn't enough, Jennifer, her mom Jo, and our mutual best pal Ellen came to my house for Christmas Day. I made (on Jenn's request) Eggs Benedict with crab cakes and homemade hollandaise, with hot chocolate or mocha. Then we opened presents and delved into stockings (my first!) and generally had a fabulous time together. That alone was a gift without measure. Jenn is an artist--she gave me a painting inspired by my book! Her mom was thrilled to get a caricature of Jenn--it looks just like her! Ellen gave us all headlights...just in case. My booty and my new stocking that Jenn made and decorated with the name she used to call me as a kid: Mommy Debbie. Cat treats, author goodies, and rainbow duct tape! I'm pretty tired--it has been a long, exhausting, rewarding month at The Artisans' Guild, and I worked Christmas Eve until after 4. I'll be back to work tomorrow (Friday), but I'll have an awful lot of great memories to carry through into the new year. Sunday, December 21st marks the Winter Solstice, known by some as Yule. The solstice is celebrated around the world in many different fashions; it is the longest day of the year, and therefore marks the returning of the light, as each day after brings with it a few more minutes of sunlight. For those people like me who live in chilly climates, this holiday symbolizes hope in the midst of the cold and dark. This is part of why many cultures bring pine trees and other greenery indoors, as a symbol of life in the season when most things are either dead or dormant. The Winter Solstice is the official first day of winter, though, so even as we greet the reborn sun, we know that we must somehow make it through the next few months of relative darkness while we wait for spring to return. Many folks struggle with depression due to the lack of sunlight, or feel oppressed by the cold and the long nights. In our modern society, we tend to ignore the turn of the Wheel of the Year, and try to maintain the same schedule and level of activity no matter what the season—but it usually doesn’t work very well, and we end up stressed and tired and blue. So while most of us can’t just stay home from work and sit by the fire, there are a few ways we can take a hint from our ancestors and embrace the winter darkness in ways that feed our souls and keep us mentally, physically, and spiritually healthier. If you can, try going to bed earlier, or at least be quieter in the evenings; turn off the TV and read a book, put together a picture puzzle, or write in a journal. If you have children, spend some time together telling stories—take turns reading from a shared book, or each make up part of a continuing saga that you tell each night. Focus on imagination instead of electronics, putting away the phones and gizmos for a few hours and learning a new craft or practicing an old one. If you have an elder in the family who has a creative gift, now is the perfect time for them to share it with others. Cook together as a family, making hearty stews or soups, or kneading bread. The dark times are meant to be more internal and less external, so you may wish to spend more time alone or with the family unit. But you can also “hunker down” with friends or family and do fun inside activities, like movie night with homemade popcorn, or playing board games or card games. Laughter makes even the darkest night brighter. If you have someone to cuddle with—whether human or companion animal—there is no better way to spend a cold winter night. Throw in a good book and a mug of hot chocolate (or a glass of wine), and a cookie baked with love, and you’re all set, even if you have to wrap yourself in a fuzzy blanket and cuddle with that. Don’t forget to take time to appreciate the stark beauty of the quiet season. I miss the green abundance of summer, but the white snow on the black branches and a brilliant red flash from a passing cardinal can always raise my spirits. Singing, playing or listening to music, or enjoying favorite movies and books can also help you get through the long dark hours. Soon enough the Wheel will turn and the small green shoots will poke their cheerful heads up through the ground, but until that time comes, try embracing the blessings of the darkness in all their quiet potential. Blessed solstice greetings to you all! I admit it--Christmas has never been my holiday. Not that I have anything against it, it just was never a big part of my life. I grew up Jewish and celebrated Chanukah. Then as an adult, I became a Pagan and now I celebrate Yule (the Winter Solstice). There were a couple of years in there when I was married, and put up a tree with my then-husband for my step-daughter, but otherwise, Christmas was pretty much something my friends celebrated that didn't have much to do with me. I have two weaknesses at this time of year: Hallmark Christmas movies and romance novels about Christmas. I KNOW--I said it was ironic! This year's reading, among others. I don't know exactly what it is that draws me to these admittedly sappy movies and books about a holiday I don't even observe. There is something warm and comforting about them, I suppose, that makes me happy during the harried madness of the season and the cold and dark of the winter nights. So, now you know my secret. Shhhhh...don't tell anyone. But you can tell me--do YOU watch Hallmark Christmas movies or read holiday-themed books? (And if so, which are your favorites) It's okay if you do. Your secret is safe with me. 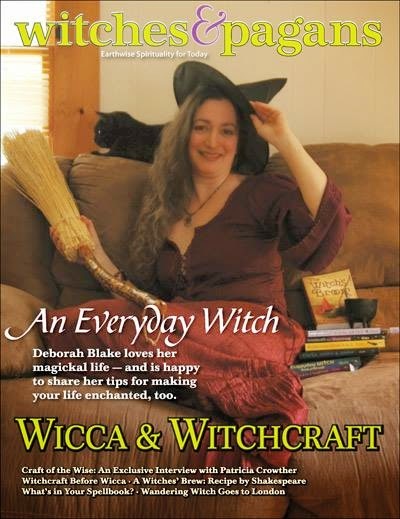 As some of you know, I am actually on the cover of the next Witches & Pagans Magazine, and the lovely C.S. MacCath does an in-depth interview with me inside. The magazine has just gone to print! And there is a 72 hour special advance-buy price, if any of you are interested in getting a copy. “Wicca & Witchcraft” is at press. Order in the next 72 hours, you can get this issue at a special introductory price of $6.45! My sister is the good-looking one to the left. On the right you can see my stalwart friend Ellen, who did the driving. Got to see a longtime fan, Josephine F.
As well as the radiant Rebecca Elson of The Magical Buffet, who brought me goodies! And got a surprise visit from a formal local and Blue Moon Circle regular, Lauren, which made my day! The book signing was kind of the highlight of a truly fabulous book release week. I've been working hard, but having a lot of fun, so I have a couple of gifts for you folks, who have all helped to make the release of both Baba Yaga books, WICKEDLY DANGEROUS in September and WICKEDLY WONDERFUL on December 2nd so successful. First of all, I have a fun, FREE Baba Yaga short story for you! The lovely folks at Literary Escapism do a cool thing where they ask various authors to write a short short story about their protagonists going holiday shopping. Of course, since Beka is a witch, she goes Yule shopping, and needless to say, it isn't all that simple. I hope you enjoy this story, since I had a lot of fun writing it. And, of course, I had to do one last big, blowout giveaway! I can't express how much I appreciate everyone's support--buying the books, and posting reviews, and spreading the word. But maybe this will help. I'm giving away the ultimate Baba Yaga series prize pack: signed copies of both books, Wickedly Wonderful mug, a Chudo-Yudo dragon necklace (because we're all about the dragons around here), bookmarks, postcards, magnets, and two dragon temporary tattoo booklets! This would make the perfect ready-made holiday gift for a friend who likes paranormal romance...or for yourself, of course. So THANK YOU, so much for being such a great cheering section, and good luck to you all! Some of you are already acquainted with my cat Mystic the Magnificent, brother of the slightly-more-famous Magic the Cat (Queen of the Universe). Mystic is my big guy--a little over 16 lbs, with shoulders that stand about 3 inches above those of his sister and mother. He's mostly a gentle giant, when he's not trying to kill poor Samhain (who weighs a tad over 6 lbs and never did anything to him other than to refuse to back down in the 8 years she's lived here) or pick on his mom or sister. But really, just a big Pooh Bear most of the time. About a month and a half ago, I took Mystic, Magic, and their mom Minerva for their yearly check-up and shots (yes, it IS fun taking them all at once, thank you for asking). Dr. Baker looked at the lump, said it looked exactly the same, and to watch and wait. So naturally, two weeks after that, the lump suddenly got much bigger. It was obvious he'd been kicking at it, so it may have been just the area around it. Back to the vet we went, and she said, "Yup. We should probably take that off." Scheduled surgery for a week later. I deprived him of breakfast and dropped him off before work anyway, with the message that the doc should do what she thought best. She voted to "watch and wait" again, and home we went. So this Monday we went through the whole thing again (except that now he was wise to me and hid behind the furniture and made me chase him around for 15 minutes before I could stuff him in the carrier) and this time the danged lump came off. (Along with a sizeable chunk of my wallet.) The vet sent the lump out for a biopsy, and we should hear back sometime next week. I'm not too worried, really, but a few crossed fingers and some aggressive wood-knocking might be good. Here's poor Mystic after. He came home wearing a surgical stocking to keep him from scratching at the stitches, but as you can see, it didn't really fit well. Bad spot, large cat. Also, he unraveled part of it and tried to choke himself. They shaved a LOT of fur. So I went to the pet store to look for an alternative. Unfortunately, he is SO big, most of the kitty things didn't work. But I did find this cute kitty pirate harness with hoodie. Needless to say, the cat was not amused. My cats don't go outside, so they've never even worn collars. This is my friend Julie's coat he's sitting on. I think he was hoping to go home with her. This one worked for a while, until Wednesday night, when the incision must have really started itching. It did seem to keep him from getting at the stitches, but it didn't really go up high enough, and by Thursday morning, it looked like this. Guess I'm not going to be able to take this one back to the store. So Thursday after work, I went back to the pet store and found this cool coat meant for a small dog instead. Is it just me, or does he look a little like The Fonz? That's Minerva, looking extremely dubious. Coolest cat on the block. Also, no way to reach the stitches, because of the collar. Hopefully, this will keep the stitches intact until we go back to the vet next Wednesday to have them removed. Anyone else have any cat (or dog) surgery stories to share? I was surprised that no one said "Congrats!" on my release day post on Tuesday. I guess you were all out buying WICKEDLY WONDERFUL, right? Of course, lots of people said lovely things on Facebook, and THANK YOU so much to all those who spread the word. And of course, to those who did run out and buy the book, you have my undying appreciation. SMOOCHES. I'm all around the interwebs this week, with lots of guest interviews on various reviewer's blogs. (And getting lots of good reviews--WHEW.) Most of them are giving away a free copy of the book, too. Fabulous review at I Smell Sheep--I got 5 Sheep! 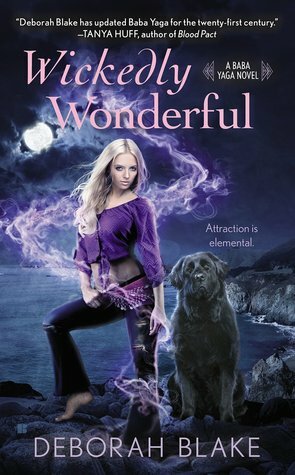 And I'm giving away one more signed copy of Wickedly Wonderful on Goodreads. The contest ends December 14th, so don't wait! Giveaway ends December 14, 2014. Yep--all of it! So keep your eyes open. I'll be putting the giveaway up here soon. In the meanwhile, I'm dying to know...has anyone started reading the book? What do you think?